Combine flour, cake mix, baking powder, sugar and salt in a bowl and mix. Add 1 cup of milk, eggs, and vanilla extract. Stir until smooth. Add additional milk until batter has the consistency of pancake batter. You can also add more cake mix if you want your pancakes to have a stronger cake batter flavor. Preheat a skillet to low to medium heat. Fold desired amount of sprinkles into batter. Pour batter in 1/4 cup measurements onto skillet and let cook until bubbles form on top, about 2-3 minutes. Flip and cook for 1 minute more. Serve with vanilla glaze (recipe follows). For vanilla glaze: mix powdered sugar, butter, and vanilla and milk until glaze forms. You may need to add a little more milk to reach desired consistency so that it can be drizzled. Mix into glaze and drizzle on pancakes. 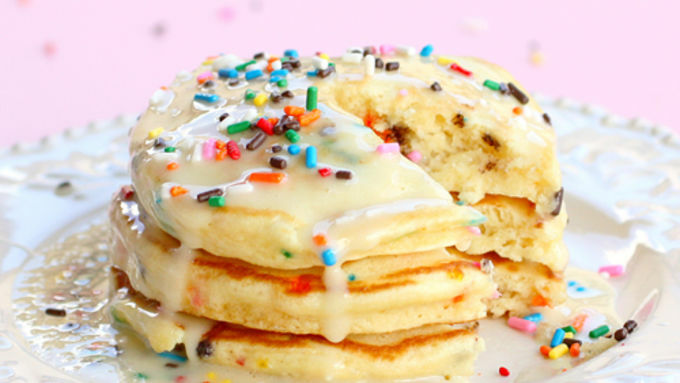 Just when you thought Saturday mornings couldn’t get any better, these Cake Batter Pancakes enter the scene. But I couldn’t wait until Saturday to make these. I made them on a Tuesday afternoon because…well, what a better way to get over the midweek hump? 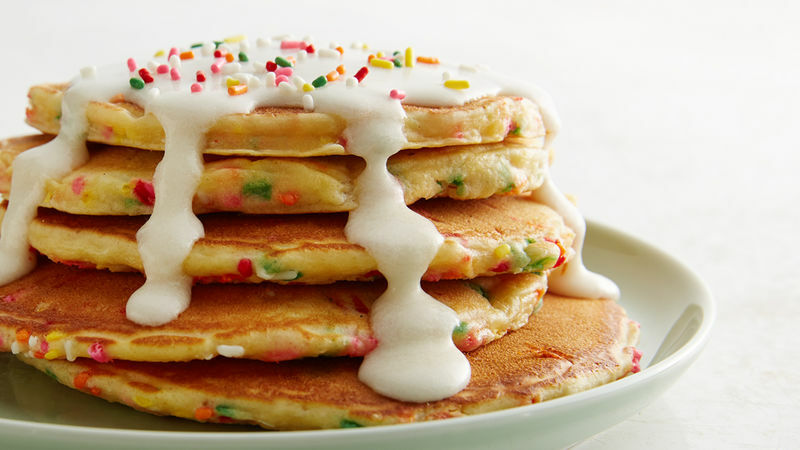 Cake…Batter…Sprinkles…Pancakes. Amen. I first saw these over at How Sweet It Is, where Jessica shares my love for cake-batter flavored foods. The thing is…life isn’t always rainbows, but with a generous splash of sprinkles it can be. Pancake batter is infused with cake batter flavor with the help of aBetty Crocker™ Cake Mix and baked up into light and fluffy pancakes. Don’t they look almost too good to eat? Almost… As if cake batter pancakes weren’t enough to put you into sugar euphoria, I topped them with a vanilla glaze drowning in sprinkles. Diving into these pancakes, each bite was a pleasant surprise of cheerful pops of color and flavor. 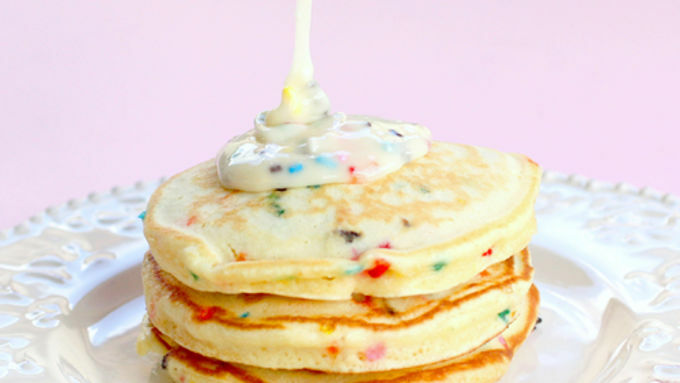 These Cake Batter Pancakes are perfect for a birthday, special occasion, or in my case….a Tuesday. The bills and treadmills will always be waiting for you, but don’t wait to try these babies. Make them for breakfast. Make them for dinner. Make them for your un-birthday. Make them because the sun is shining…or because it’s snowing outside. 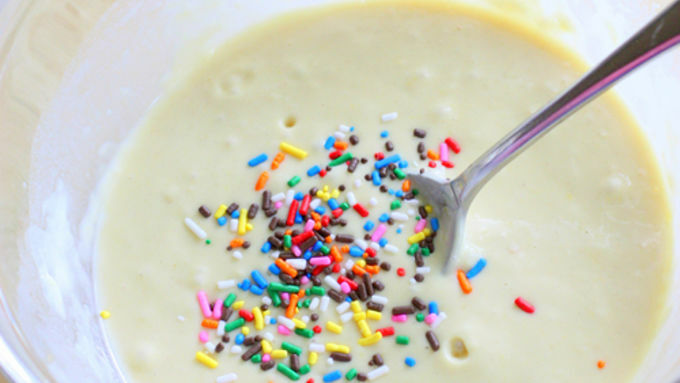 Do you really need an excuse to indulge in cake batter and sprinkle fun?